DivX latest tech preview introduces support for DivX Plus HD video in applications using the Microsoft Media Foundation, a new framework introduced in Windows 7. The package includes a native version of the DivX MKV Demux as well as shell extensions that provide thumbnail images and detailed file information for files with either “.divx” (DivX 6) or “.mkv” (DivX 7) extensions for an enhanced experience. 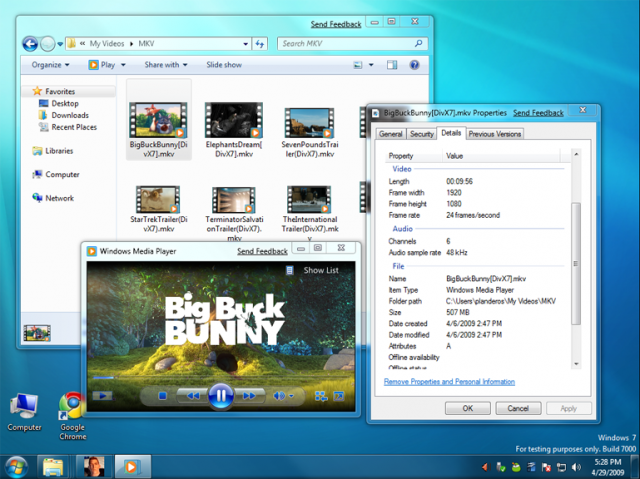 The advantages of enabling MKV file support in the Media Foundation framework include the ability to use hardware acceleration for H.264 video decoding via the system H.264 decoder (where supported), as well as adding support for serving both DivX and DivX Plus HD video through Windows Media Center Extenders and the Windows Media Network Sharing Service for UPNP devices.